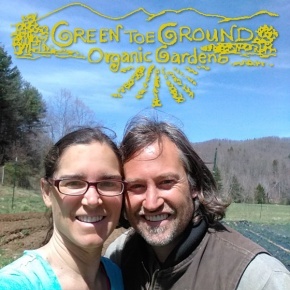 Gaelan and Nicole have been farming at Green Toe Ground since 2001. The farm sits on 16 acres of mixed rolling hills and flat river floodplain - 4 of which are cultivated. The land was used as a cattle pasture for 25 years before Green Toe Ground was created. The soil is a mix of sandy loam and clay loam with few rocks. The farm is a mixed vegetable operation, with a flock of sheep, one cow, one horse, pigs and bees. Gaelan and Nicole are the hands and back that farm, with usually 1 or 2 interns per year. They purchased the farm land is 2006 after renting it previously.They use a spader for tillage and proudly do the rest by hand & hoe. Gaelan and Nicole instituted Biodynamics in earnest in 2004. They felt that it spoke more to the philosophy of a whole farm organism. They added animals to begin the process of integrating all the aspects of our land base. They use the animals to maintain the pastures as pastures. They also provide the much needed fertility source of farm- manure. In 2016, we decided to pursue Demeter certification for our organic and biodynamic practices.